April seems to have gone mad. A week ago we had temperatures of about 20 °C with blue skies and no rain at all, now we have 8 °C and an unpredictable mixture of sun, wind and snow showers. However, bird migration keeps still going on, almost as if it wouldn't even have noticed it. Sadly, my free time is now rather limited and I won't have many chances to go outside in the next two weeks, so this might be the last post for some time. We'll see. Originally, I didn't want to go birding this week either, but when news of a reddish Barn Swallow reached me, I couldn't resist. This is because mainly the subspecies of the Middle East (and North America) show reddish underparts in contrast to the european form rustica, which is cream coloured there. Of course, it's not as easy as it might sound right now, since the transitions are fluid. 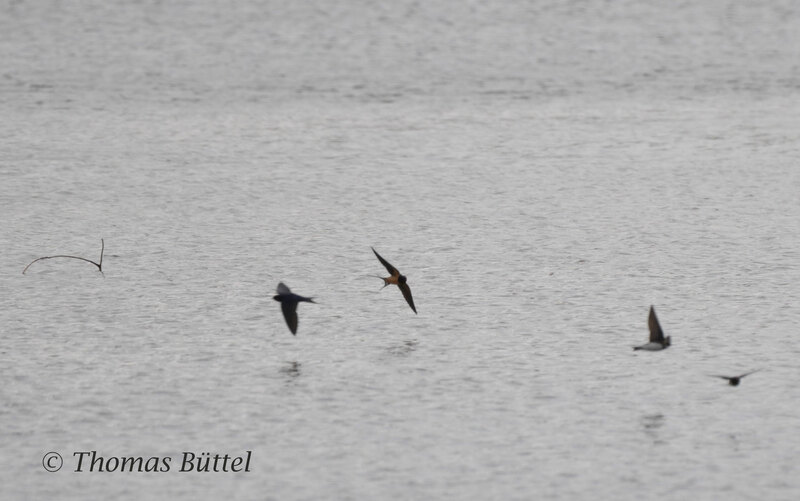 In fact, it seems almost impossible to identify Barn Swallows on subspecies level here in Central Europe at all. 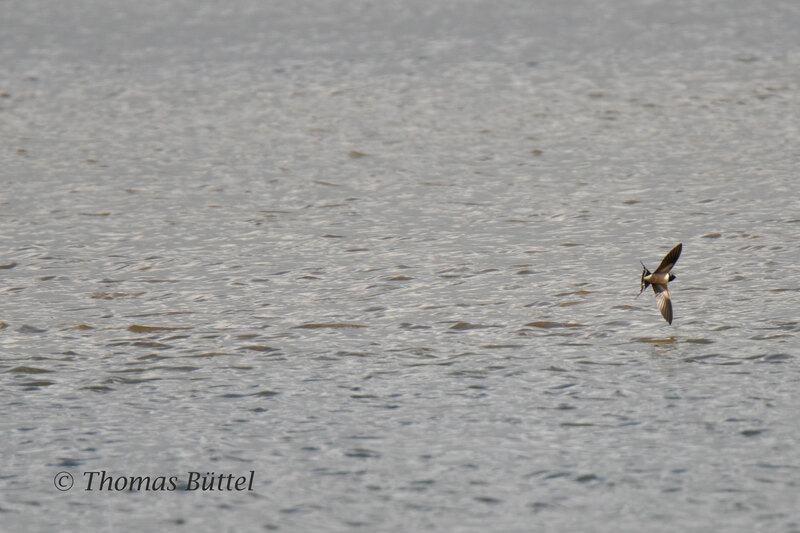 Fortunately, I soon received the answer of an experienced birder, who said that the moult stage is the key of ID. Having now learned that it theoretically is possible to identify a non-european Barn Swallow, I finally gave the bird a try. However, I didn't expect that there were not only a few dozens but myriads of Swallows, House and Sand Martins. It simply was impossible to check every Swallow or even to get the necessary close-up shots. So I had to change my strategy and took pictures of any swallow which came close enough. As you can see in the first picture, there actually was a reddish looking individual, which was however too far away and could still be a very intensive coloured bird of the nominate race. 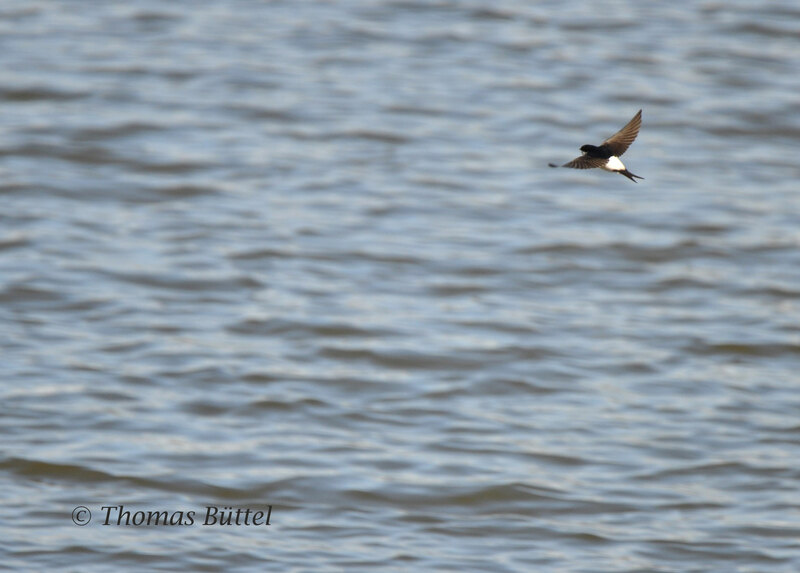 Unless no one gets better photos, the ID on subspecies level is impossible. Regardless of its real subspecies status it was indeed educational, which is - at least in my opinion - more important. Hopefully, some more turn up in the future, so that we get clarity about these swallows.